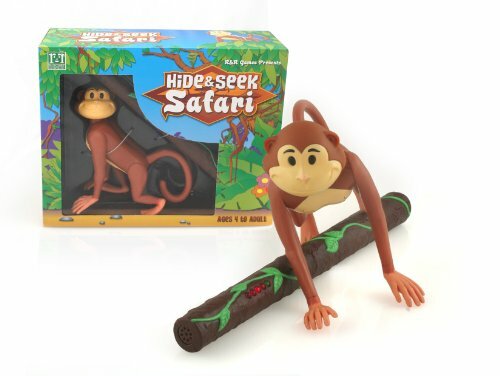 Introducing the Hide and Seek Safari Monkey. The folks at R & R Games have brought the childhood classic "Hotter, Colder" into the 21st Century. An all new animal for use alone or with the other Hide and Seek animals. Use the Seeker wand to track down and catch this elusive Monkey. Lights flash to show you're getting warmer and the Seeker will sound when the Monkey is near. Requires one 9V and two "AA" batteries, included. Kids love stuffed animals as much as they love to play hide and seek. 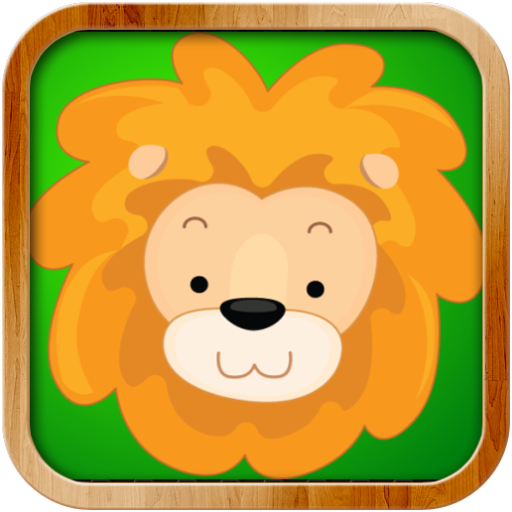 Hide and Seek Safari Jr. combines both into one surefire hit. 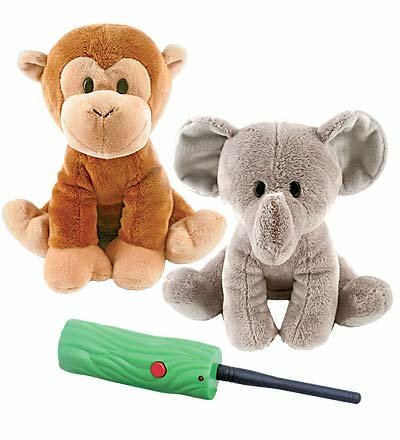 Give kids the remote control wand and send them on a safari adventure in search of the "missing" baby jungle animal. 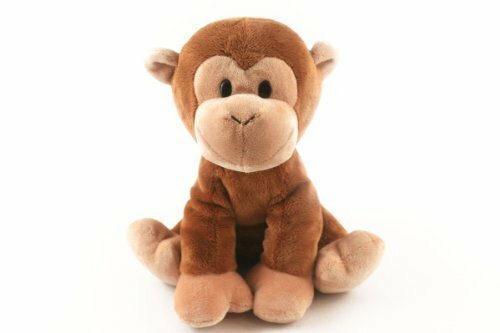 The Safari Jr. friend makes a sound (the elephant trumpets, the monkey chatters, the lion roars) to let them know when they're getting close. For ages 3 and up. Available Styles:Elephant, Lion, Monkey.ATTENTION: This is an exclusive HearthSong product that is only available from us. Please be sure to choose HearthSong as the seller to guarantee you are receiving a product that has been both properly constructed and thoroughly tested to meet all U.S. child safety regulations. No other sellers are authorized to offer this unique product on Amazon, and HearthSong-provided warranties will be invalid for purchases through unauthorized sellers. Two little monkeys swinging in a tree...while one little friend plays hide and seek! This joyous jungle set features vivid colors and fabulous animal friends playing in the tropical foliage. Your child will love the snoozing giraffe, strolling elephant, and other familiar jungle creatures in this beautifully detailed wall display. 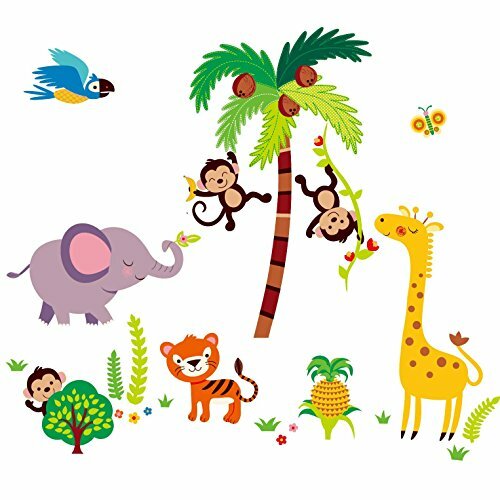 Entire decal assembles about 4' x 6' Tree: 34" tall Elephant: 11" x 19" Giraffe: 25" x 12" Monkeys: 9" tall Tiger: 10" x 11" Bird: 7" x 10"
Match the Exotic Safari Animals with Professor Poplar!My name is Professor Poplar, and this is my patented Exotic Safari Puzzle Board, with eight extra-chunky shapes! The tall giraffe, the hungry hippo, and the spiny hedgehog, they're all here, and it's quite the sight to see. 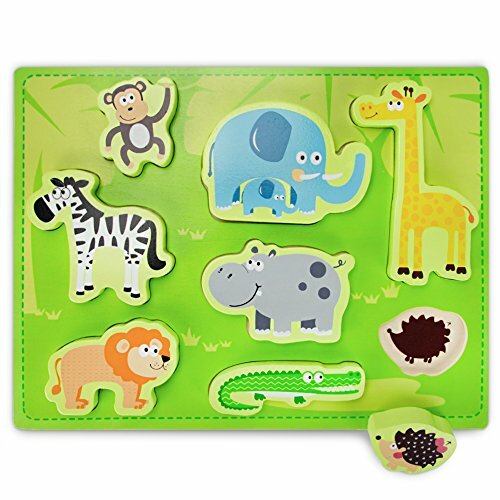 Playing with this puzzle is a terrific, sensory way for the earliest of early learners to feel out the shapes and sizes of all sorts of exotic animals native to Africa. I've specially engineered it to engage fine motor skills and promote color-matching and problem solving! And, of course, all my puzzle pieces are cut from natural wood and finished with safe, water-based paint.